Windows creates the Network Map in part by using the Link Layer Topology Discovery (LLTD) protocol. LLTD functions at Layer 2 (the layer that devices use to communicate on a LAN), allowing network devices to identify each other, learn about the network (including bandwidth capabilities), and establish communications (even if devices are not yet configured with IP addresses). While you don’t usually need to manage LLTD, there are a couple Group Policy settings that you can use to configure LLTD. These two settings are located within Computer Configuration\Policies\Administrative Templates\Network\Link Layer Topology Discovery. This setting enables computers to be discovered on a network and to participate in Quality of Service (QoS) activities, such as bandwidth estimation and network health analysis. You can choose to enable the responder driver while connected to networks of the domain, public, or private location type. This enables a computer to discover the topology of the local network and to initiate QoS requests. You can choose to enable the mapper driver while connected to networks of the domain, public, or private location type. 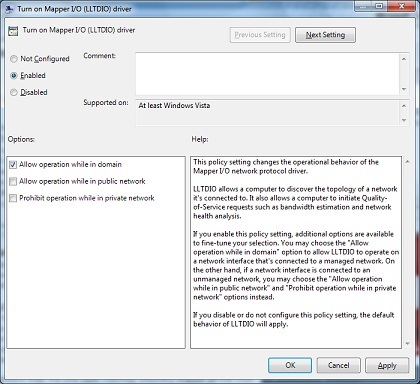 To enable Network Map on a computer that is connected to a domain, you need to enable the LLTDIO Driver Group Policy setting and select the Allow Operation While In Domain check box. For Windows to create a full Network Map, the Link Layer Topology Discovery Mapper service must be running and network mapping must be enabled. This service is set to start manually by default. You should avoid disabling the Link Layer Topology Discovery Mapper service unless you also want to disable network mapping. Note that LLTD is not a secure protocol and there is no guarantee that the Network Map is accurate. It is possible for devices on the network to send false announcements, adding bogus items to the map. And Windows might not display devices that do not support LLTD (such as systems running Windows XP).